Stress is killing our ability to be creative, Bruce Daisley, EMEA vice-president at Twitter, has warned. Daisley, who runs his own podcast Eat, Sleep, Work, Repeat that explores workplace culture and practice, said: "Anytime you have any fear, or any anxiety in an environment where you are expected to be creative it kills that ability." 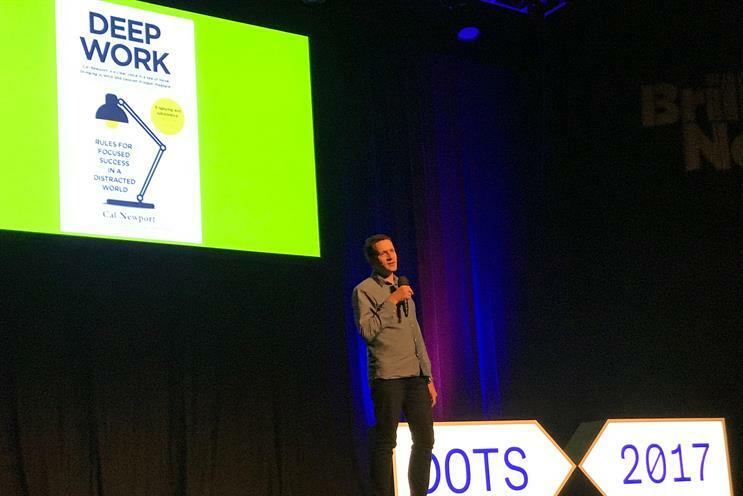 Unveiling his New Work Manifesto at the Dots conference, curated and hosted by Brilliant Noise, in Brighton today, above, Daisley explained there are simple steps people can make to manage their energy and increase productivity. Top of this list was getting more sleep and surrounding yourself with positive and happy friends. According to research from Gallup, the average working hours have gone up 27%. We have added two hours to our working day by using email and McKinsey data suggests that 30% of all work is now email. It is state of play which is leaving people chained to their desks. As Daisley explains: "You used to spend your lunch hour outside and at the least go to Boots and gaze at the Meal Deal but now people eat 'al-desko' and report being exhausted." Worse still in this highly-stressed state, 78% of people report going to work and shutting off, while one in five sick days are stress-related. Daisley said these data are "an aggregate a sign that work is becoming too much for us." Daisley added that "interruption" is the biggest disruption to creative work and an open-plan office is the "enemy of getting anything done". He warned that we are in danger of being sidelined by shallow work, such as clearing the daily deluge of emails. "Anytime anything of substance is created it is often in ‘deep work’ a state that requires people to find their creative flow free of distractions," Daisley added. Daisley also called time on the "productivity paradox" whereby people are working longer hours but not actually increasing their productivity. Taking aim at the long hours culture, he said that "40 hours is enough" and that the marginal gains of working longer than this are miniscule. Pointing to former Yahoo boss Marissa Mayer's much-quoted claim that her success at Google was down to working 130-hours a week, he said "there is no evidence to support this." He also urged the "people talking about culture" to get closer to the evidence and to science to challenge the status quo: "One of the things we find consistently is we talk about change and being creative but one of the things you find consistently in the working world is that we are scared to innovate in our working lives." Your call: Will 280 characters change Twitter?